You don’t have to be a technical trader but what you must know are some basic patterns of a technical analysis. A flag and a triangle surely rank among such patterns. They are easy to identify and used for trading or at least as a signal. Let’s take a look at how to recognize them. As the name suggests, you should look for a pattern in the chart, whose shape reminds you of a triangle i.e. a price development heading to the top. Price spread is getting smaller and must head in one direction. This will result in the intersection of one of the hypothetical extensions of the triangle’s arm and form a new trading signal. This trading strategy is applicable to forex, binary options, cryptocurrencies, commodities, shares… It’s universal; traders call such strategies robust strategies. There are three types of triangle: symmetrical, ascending and descending. The lower arm of a descending triangle is horizontal as opposed to an ascending triangle whose upper arm is horizontal. Below you can find a graphical illustration of the three types of the triangle: symmetrical, ascending and descending. One cannot clearly say that a descending triangle will represent the onset of a short or long position. In trading strategies using triangle (both ascending and descending) a strong support/resistance line (horizontal) and a trend line (sloping) concur. Both levels are important; it depends on which one is more. Anyway, the individual instruments are somewhat different. While the descending triangle may, for the same currency pair, indicate a downward breakthrough the ascending triangle may signal the opposite, an upward breakthrough. The intersection of the arm near the triangle’s top means a new signal. Which of the arms will be intersected and which way the price will continue to depend on the market’s overall sentiment. For example at the end of 2017 during the cryptocurrency boom, the price continued to fall while all triangles would be broken downwards. If you are not enthused about triangles (because they are unclear) look at flags. These patterns can also predict movement direction. The main difference between triangle and flag is the situation before the formation of the pattern. The formation of a triangle is preceded by sideways market moves or, a moderate trend. As to flags, the market is strongly in trend and flag is a signal of consolidation. This is a movement when the market rests and, following a strong trend, small corrections take place. The flag may be in a shape of a triangle but mostly the shape is two parallels. With the flag trading strategy, one can expect a breakthrough and a return back to trend. This may not be true for 100% but at least for 50% of cases. Trading of options or traditional forex trading is not a rocket science. Sometimes it only requires common sense and the knowledge of some basic patterns. Flag a triangle are instruments that should be made part of your trading arsenal for at least passive trading. 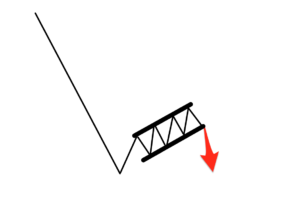 Anyway, some of you may have done so before using trend lines in trading without being aware of this. As I said, no rocket science.